My name is Owen Sechrist and I'm the President and founder of Ruby Construction LLC. I was formerly a Lancaster area chef and partner in a successful upscale bar and restaurant in downtown Lancaster. After leaving the restaurant business I pursued my other interest, a career in building, starting at the bottom rung of a custom home builder and remodeler in northern Lancaster County. Later I opened a one man construction business under the name Sechrist Remodeling and began doing remodeling work for Lancaster County homeowners as well as subcontracting for several area companies doing trim carpentry, running remodeling projects, running commercial projects and performing project management services. 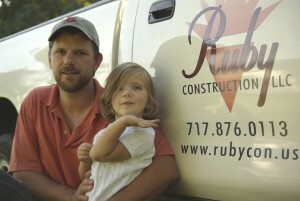 Ruby Construction LLC, named after my daughter, was born out of a desire to shift focus from several areas of construction to what I most enjoy: completely satisfying the home-owner client, by providing you with high quality residential remodeling construction services and building durable, beautiful, and intelligently designed projects. Our process is simple, although easier said than done: I listen very attentively to what you are looking to achieve with your project. I then work on design elements that will improve functionality and if you desire explore sustainable building options that address any of your concerns about energy efficiency, sustainability in regard to the world at large or concerns about your personal environment, such as air quality in the home. We then efficiently complete the project in the allotted amount of time with an exceptional level of quality and attention to detail. Throughout this process I and my team are very personable and respectful of your home and the disruption we're causing in it, and go to great lengths to make you feel as comfortable as possible by being extremely clean, leaving things as we found them, doing small favors such as disposing of an old piece of furniture cluttering the basement or bringing in the newspaper every day. We then follow up with fantastic warranty service and in many cases become a resource for our clients on everything to do with their home's maintenance and improvement.